Harrisburg is the capital of Pennsylvania, the 17th largest economy in the world (right behind Mexico and ahead of Switzerland). The reason for its existence is often thought of as only a compromise location for the state capital because of the long-lived animosity of the two large cities in the state, Philadelphia and Pittsburgh. 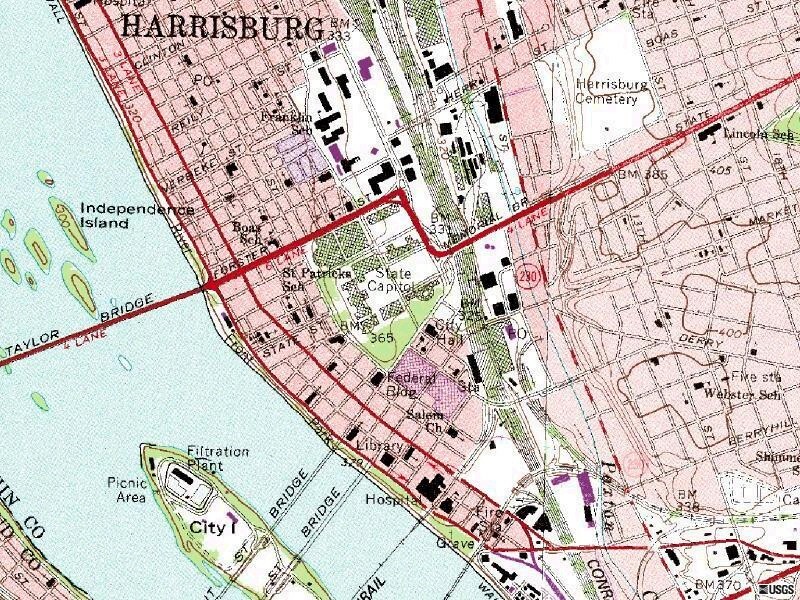 Actually, Harrisburg's location makes its the natural convergence of several important transportation routes, creating a dynamic economy even without the state governmnent. 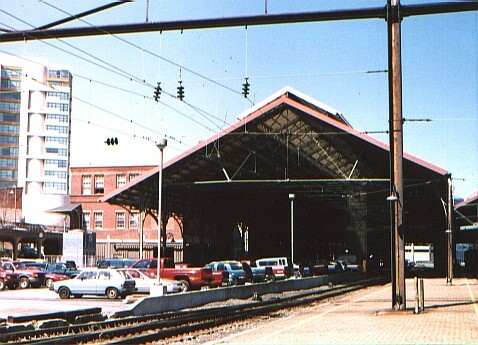 A case in point is the location of the Harrisburg rail station, a longtime locus of several important railroutes. Of course the major railroute was the Main Line of the PRR. The PRR is kind of like the Yankees, you either love them or could do without them. One has to admit that the Standard Railroad of the World had some mighty fine early management that certainly left the B&O wondering what hit them. Here we see the end of the electrification territory from Philadelphia to Harrisburg. Amtrak plies this route under diesel power these days. I am certainly not a PRR expert, however I would guess 104 is the mileage to Philadelphia but have no idea where 50 miles west would put you. I stopped to take these photo on lunch break. Not only were two Amtrak trains active, I got to see this long local pulled by a two interesting EMD products, GP 2955 and switcher 2217. 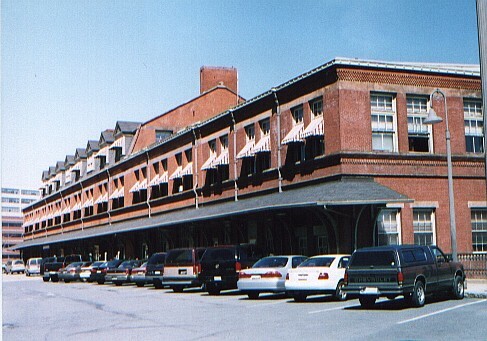 The local apparently originated at Steelton, carrying the product of the mill which included these bars and rail. Note the tower in the upper right. In this photo is possibly three rail lines. Here are my GUESSES. 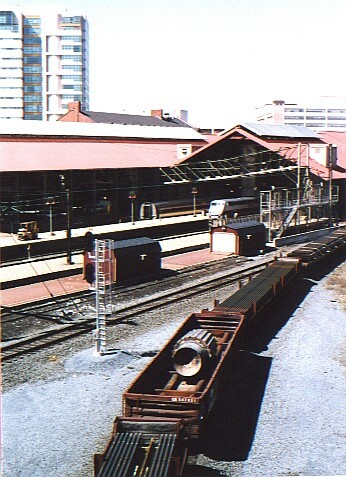 The one on the left is the connection with the Reading to Rutherford Yard. One of the lines might be the Steelton & Highspire, the origin of the steel-ladened local. And, of course the PRR. 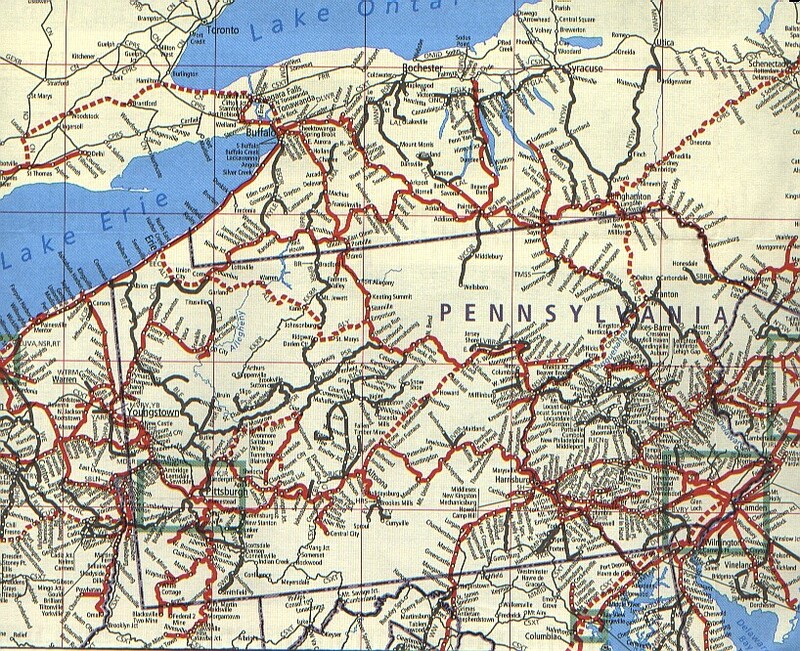 The trouble is that newer maps show everything as Conrail ( and now NS). Any quesses what the cylinder object is? One of my favorite Harrisburg railroads was the Cumberland Valley, an early pioneer road. Here we see the north end of this railroute that reached to Winchester Virginia down the Great Valley. The steep track is necessary to raise the line across the Susquehanna on a substantial bridge. The east and west approaches to this bridge is now used as a wye to turn Amtrak equipment. There are plans however to reactivate the bridge as a commuter line from Carlise into Harrisburg and then on down the Susquehanna to Lancaster. On the other side of the bridge the former Cumberland Valley is very active to Carlisle, freight is marshalled in Shiremanstown to serve industry in Mechanicsburg and Carlisle. South of Carlise the line is abandoned until Shippensburg, the NS instead using the former Harrisburg and Potomac Reading line to connect the north/south rail route. 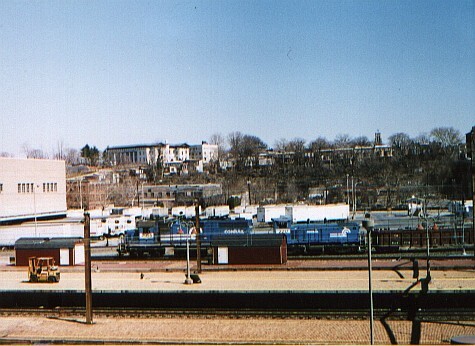 Harrisburg Station is several blocks down from the State Capital building. Due to order status, the steel- and rail-making in the plant is not currently operating. Our tour will visit the S&H RR Shops, the 20" mill, the roll shop and the rail finishing area. However, description of the rest of the plant is included because we will see these areas of the plant as we drive through, and they are covered in the photographs. And who knows, maybe they will be in full operation and we can have another tour next time we have a meeting at Camp Hill! The Steelton and Highspire loco shop services all the S&H's locomotives and also currently contracts to maintain the 80-ton GE center cab locomotive at the nearby Letterkenny Depot. Note that the east bay of the engine house is served by 3' gauge track. Back when the plant produced ingots, the ingot operation was serviced with 3' gauge railway, as at Bethlehem. There is no narrow gauge motive power used in the plant any more, although the cars that transfer blooms from the caster to the soaking pits are 3' gauge. The S&H has had other makes of locomotives in earlier years but is an all-EMD shop now. A roster of equipment is appended. 1. On your way to or from the loco shop you will see the heavy-duty flatcars with special large ingot molds on board. If you are a student of the steel industry, you may have a sense of deja vous. Yes, these used to be at Bethlehem, Pennsylvania. When the Bethlehem plant was shut down and BethForge was sold to the Park Corporation (Lehigh Heavy Forge), Steelton began casting the large ingots from these molds. These are chiefly used in the nuclear energy industry. You can even see signs of the old BSCO road numbers. 2.Parked somewhere around the plant is a string of ex-PRR G38 ore gondolas with lids on them. These are used for controlled bloom cooling. Lettering appears to be solid rust with no remnants of PRR/PC/CR lettering or paint visible that I could see. 3. There is an extant unique, steel truss-rod flat car with arch bar trucks that is used to transfer heavy equipment like transformers inside the plant. Just south and east of the S&H shops is the 20" mill. This is an interesting, older mill which currently produces rail splice bars. We will visit this mill in operation. This is located in a large shed-like building at the north end of the plant. The scrap is kept under cover because the electric furnace gets angry when it encounters moisture in its charge. After sorting, scrap is loaded into large charging buckets and conveyed by rubber tired transporters to the steelmaking area. Upon entering the steel making building you will probably see one or more of the scrap charging buckets on a staging platform. The single, 148-ton electric furnace is operated with direct current. This has a single, 28" diameter electrode. The other electrode is in the bottom of the furnace. This differs from the three visible electrodes in AC furnaces. This furnace replaced two alternating current electric furnaces in 1994, which in turn replaced a battery of open hearth furnaces which in turn replaced Bessemer converters. The steel making equipment is housed in the former open hearth building. One of the old AC electric furnaces is still in place although non-functional. The DC furnace gives off a noticeably different sound from AC furnaces. Another interesting difference between this and other electric steel shops is that the ladles that the molten steel is tapped into are of a rather unusual shape, being oblong in section and tall. To the north of the electric furnace is the ladle furnace where the metallurgy of the heat is adjusted. This is basically a small electric furnace lid that is lowered into the ladle. To the east of the ladle furnace is the vacuum degassing station. Here argon gas is forced up through the heat of steel to drive out as much hydrogen as possible. The de-gassed ladle of steel is then moved via a shuttle car into the caster building immediately to the east. Outside of the steel making building is a large baghouse that captures particulate matter from the steel making operation. The caster turret, tundish and mold top are up seven flights of stairs (no elevator available). There is not much to see there other than the unique ladles (described above) as it is basically a closed process. This caster produces three blooms with a cross section of 14" x 23", a unique size. You will see the strands exiting the molds and being cut off. The blooms are loaded onto special transfer cars for rapid transfer to the soaking pits in the building to the immediate north. PST is "hot connected" which means blooms normally go directly from the caster to the soaking pits to the rail mill without being allowed to cool. This not only saves energy but avoids stress cracks in the blooms. Some blooms are sold also outside so some may be seen leaving the runout on transporter cradle trucks. The blooms are lowered into these gas-fired chambers where they are "soaked" in heat to allow them to become uniformly heated prior to the rail mill. The sound of those doors moving is marvelous. From the soaking pits, the blooms go through a series of three rolling mills where they experience a 25:1 reduction in size to become the finished rail. The first is the 44" mill which reduces the bloom in 5 passes. The 33" mill is an intermediate mill, while the final rail section is produced at the 28" mill. Along the way is a wonderful steam-powered shear. If the customer has requested it, the rail is run through a special head hardening line. Rail is trimmed, subjected to ultrasound and laser inspection, stamped with identity, straightened at two roller-straightener stations, and controlled cooled. Contrary to what the narrator said in the 1997 talk, the company now embosses "PST" on the sides of the rail. This just began in February of 2002. The embossing rolls will be changed gradually as orders are received for different rail weights and sections, so some of the less-frequently used rail sections will not be converted right away, and you may still "Bethlehem" on the sides of rails for a while. 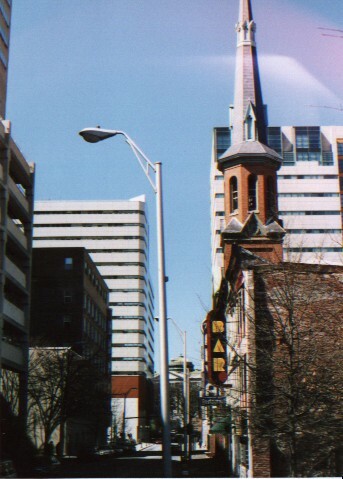 These two buildings near Gate 2 are visible from Front St. They constitute an "L" shaped complex and look like the Walthers "rolling mill" kit. This is where concrete reinforcing bar used to be made. This facility is currently used for storage. There are a number of interesting utility vehicles around the plant. In addition to the special rolling stock mentioned earlier, there are also special flat cars with insulated hoods that transport the special forging ingots to Bethlehem. There are number of old two-bay open hoppers and utility gondolas used in the plant. 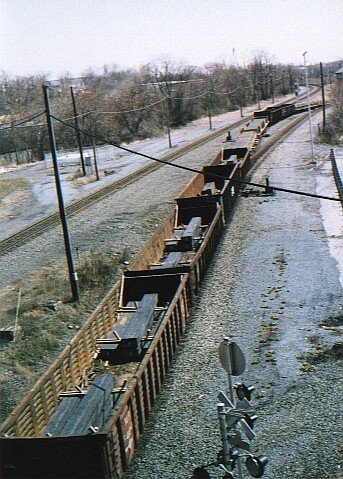 The hopper cars are mainly used to transport used rolls. Their heritage is unclear; based on the ends of some of them, some of them may be ex-C&O/ACF cars. Attached is an annotated USGS site plan that approximately identifies the various portions of the plant. 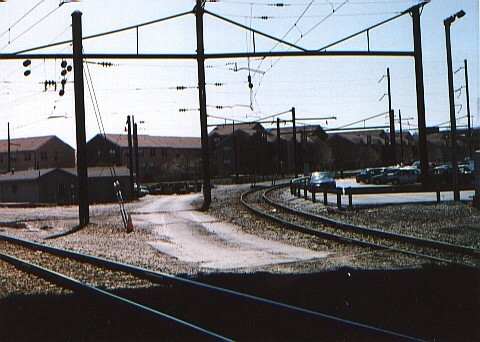 "Making Rails at PST," Transcript of a talk given to PRRT&HS attendees on April 25 1997 at Camp Hill, Pennsylvania by Walter Reynolds and Tom Furjanic. Text available at the PRRT&HS e-NEWS site and website. "Pennsylvania Steel, 1867-1916," by David Jackson. 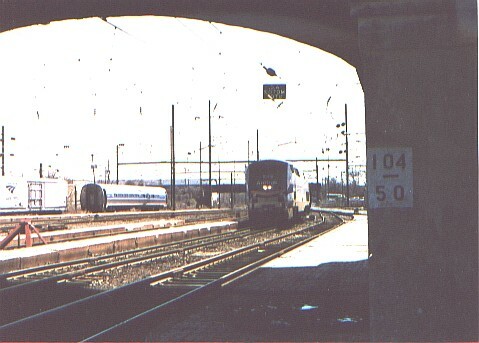 * The Keystone, Winter 1998, pp. 41-50. Covers the factual history of the company up to its acquisition by Bethlehem Steel. Fifteen illustrations and some additional references. Sparrows Point--Making Steel--The Rise and Ruin of American Industrial Might, by Mark Reutter, Summit Books, 1988. Gives an historical background of Bethlehem Steel including information about the history of operations at Steelton pretty much up to publication date. Book is readily available at a modest price through used booksellers. Pennsylvania Steel Technologies is one of three facilities in the Pennsylvania Division of Bethlehem Steel Corporation. Pennsylvania Steel Technologies (PST) is located on the east bank of the Susquehanna River just south of Harrisburg--Pennsylvania's capital. The mill covers about 1,100 acres in the Borough of Steelton. Formerly known as the village of Baldwin, Steelton was renamed in 1880 to honor the steel mills the community and the river supported. Today Steelton has 6,200 residents and encompasses 1.8 square miles. PST has the capacity to melt about 1.1 million tons of steel each year with electric arc furnace technology. The molten steel is refined (impurities removed and alloying elements added) in a ladle furnace and vacuum degasser. The steel then is poured into ingots or cast as blooms. These intermediary products are processed further at PST or sold to customers. North America's largest manufacturer of railroad rails (including in-line, head-hardened premium grades), PST is also a major producer of blooms, bars, billetts and other rolled steel products. Electric fusion welded pipe also is produced at PST. MARKETS - Transportation, oil and gas transmission, machinery and equipment, open die forging, cold drawn bars, re-rolled bar, gas cylinders and railroad axles. EMPLOYEES - 1,082 (915 Hourly, 22 Office and Technical, and 145 Salaried Exempt) PAYROLL - $39 million per year TAXES PAID - $5 million in annual payroll, property and sales taxes PURCHASES - $82 million annually from about 608 suppliers COMMUNITY - The 2001 United Way employee campaign raised almost $100,000, an amount which raised the per-employee contribution average to over $100. A Bethlehem Steel Foundation check for $1,500 was presented to the Capital Area Greenbelt Association in support of community environment programs. The funds were designated by a team of PST employees who received a 2001 Bethlehem Steel Excellence in Environmental Achievement Award for completing a project to recyle refractories from the steelmaking process.